Last year, the Journal reported that the Drug Enforcement Administration had considered conducting such surveillance at gun shows, but scrapped the plans for unclear reasons. Emails and interviews with law-enforcement officials show ICE went ahead with the strategy in 2010, relying on local police to do so. License-plate readers are increasingly used by law-enforcement agencies as a way to search for fugitives, missing children, and, recently, the man who allegedly set off a bomb in New York City. 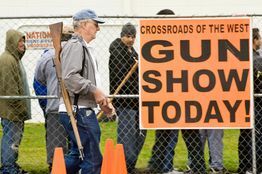 Critics such as Mr. Pratt say using the technology for gun shows is illegal in any case because of the firearm owners act, which bans the government from creating records of gun buyers except temporarily for background checks. More than half of the pages provided by the agency were completely redacted, or blacked out; others have large sections redacted, apparently to keep secret how the surveillance was undertaken.